Dual-NIC fanless Celeron 1037u router test – promising! 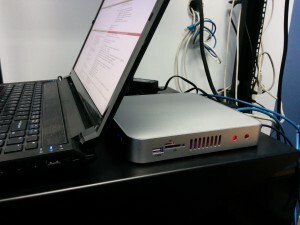 Finally found the time to set up my little fanless Celeron 1037u router project today. So far, it’s very promising! I installed Ubuntu Server on an elderly 4GB SD card I had lying around, with no problems other than the SD card being slow as molasses – which is no fault of the Alibaba machine, of course. Booted from it just fine. I plan on using this little critter at home and don’t want to deal with glacial I/O, though, so the next step was to reinstall Ubuntu Server on a 60GB Kingston SSD, which also had no problems. With Ubuntu Server (14.04.3 LTS) installed, the next step was getting a basic router-with-NAT iptables config going. I used MASQUERADE so that the LAN side would have NAT, and I went ahead and set up a couple of basic service rules – including a pinhole for forwarding iperf from the WAN side to a client machine on the LAN side – and saved them in /etc/network/iptables, suitable for being restored using /sbin/iptables-restore (ruleset at the end of this post). 935mbps up and down… not too freakin’ shabby for a lil’ completely fanless Celeron. What about OpenVPN, with 2048-bit SSL? Still rockin’ a solid 156mbps, over OpenVPN, after SSH overhead, using incompressible data. Niiiiiiice. For posterity’s sake, here is the iptables ruleset I’m using for testing on the little Celeron.